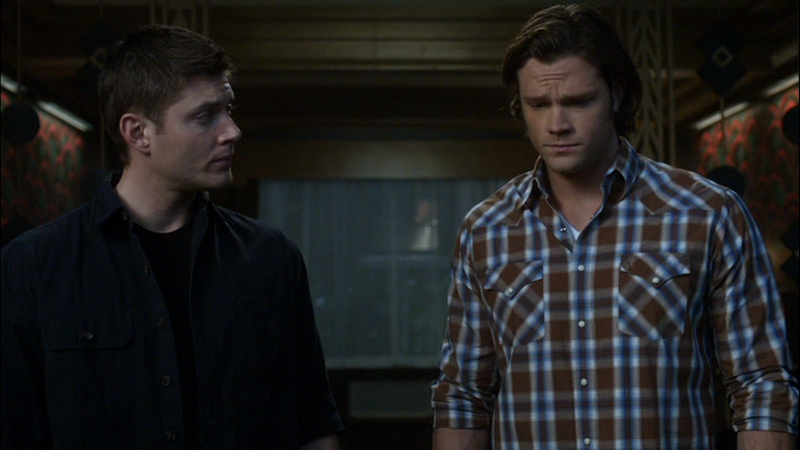 This plaid shirt is darker than Sam’s other brown and blue plaid. It does up with white snaps and the plaid runs diagonal on the pockets. In I Believe The Children Are Our Future (5x06), Sam wears it to the hospital to check out the guy who was visited by the tooth fairy, and then in the hotel room when he shows Dean the map with Jesse’s house as the epi-centre of weirdness. He wears it again at the end of the episode when he and Dean rush to Jesse’s house to find Castiel. In My Bloody Valentine (5x14), Sam changes into it after he gets home with the soul-briefcase and before they open it. He keeps the shirt on for the rest of his time on screen. In Like a Virgin (6x11), Sam wears this shirt when he invites himself on the trip to Oregon, thus forcing Bobby to decide to stay home. In Mannequin 3: The Reckoning (6x14), Sam wears this shirt when he returns to the factory to rescue the guy from the ghost, and while he salts and burns the girls remains. In Devil May Care (9x02), Sam wears this shirt when he and Dean go to rescue the Hunters that Abaddon captured. He changes once that fight is over. In King of the Damned (9x21), Sam wears this shirt until Crowley calls and Sam and Dean leave Castiel’s HQ to go take down Abaddon. In Girls, Girls, Girls (10x07), Sam wears this shirt when he and Dean go to the hotel to try to track down Rowena. In Inside Man (10x17), Sam is wearing this shirt when he gets back to the Bunker at the end of the episode. In Brother’s Keeper (10x23), Sam wears this shirt when he finds the Impala and Dean’s motel room. He keeps it on until the end of the episode. In Out of the Darkness, into the Fire (11x01) and Form and Void (11x02), Sam continues to wear this shirt for the entirity of both episodes. In LOTUS (12x08), Sam wears this shirt when they begin discussing how they’re going to get close to Lucifer now that he’s possessing the President. In Ladies Drink Free (12x16), Sam wears this shirt when they are having beers with Mick and Claire in the hotel lobby, before Mick excuses himself for an early night.